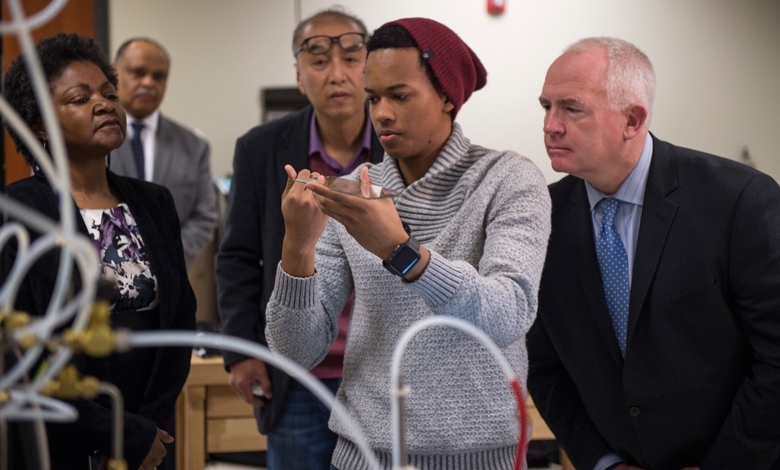 The Hampton University School of Engineering and Technology is home to a multitude of the state of the art research programs. These competitive programs serve the goals of advancement of the engineering knowledge and are essential to student education by providing support for the research-based curricula within the School. A strong partnership with the industry and other institutions provides additional leverage and benefits to these research initiatives. The School of Engineering and Technology faculty and staff broad interests and experience cover a wide variety of research topics such as power and energy systems and alternative energy, modeling and simulations, advanced manufacturing and reverse engineering, aerospace science and technology, nanotechnology, intermodal transportation systems, and biomaterials. In our research facilities and labs, students receive invaluable hands-on experience which better prepares them for their future careers and impacts both the development of the next generation workforce as well as the progress of the engineering discipline.